Admission to government schools is usually a dull and dreary affair. Parents have to be coaxed into admitting their wards. But it was a different story, when parents turned up in good numbers to admit their children in Telangana Minorities Residential Schools (TMRS). Online registration was launched for TMR Schools. Online and offline admissions to 201 schools opened. The display of classroom furniture and facilities provided at these schools was a big hit. Both parents and children were seen gawking at the smart chairs and tables, library books, health and lab facilities. TMRS Institutions Society President had inaugurated the online registration programme for TMR Schools. 130 new schools would be started by June in the State taking the total to 201. More than a lakh students would stand to benefit from these schools. At look at the functioning of the 71 TMR schools, which were opened last year, showed that there was a distinct improvement in the knowledge, health and confidence levels of the students. The admission process would continue up to March 15. The government was offering not only high quality education but also quality food and health facilities. 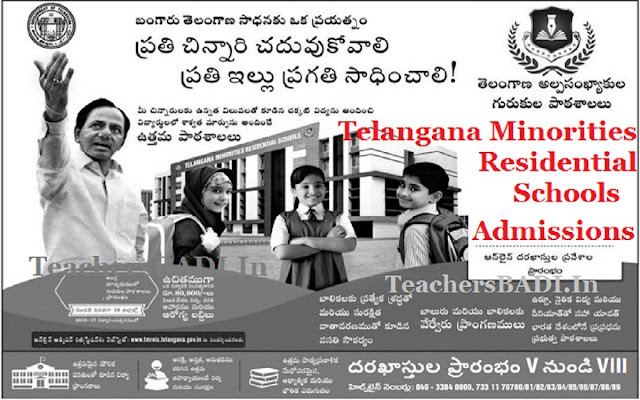 Admission to Telangana Minorities Residential schools: Admission to Telangana Minorities Residential schools from Feb 10. This year 118 new residential schools will be opened taking the total number of schools to 201. The government has advanced the process of admission for Telangana Minorities Residential (TMR) Schools to February 10 from March 15. Enrollment process for 201 TMR schools for 2019-2020 academic year will be formally launched by Deputy Chief Minister Muhammed Mahmood Ali at Haj House in February. He will launch the online enrolment, mobile App developed for the purpose besides flagging off publicity vans. The TMR Educational Institutions Society plans to admit 56,000 students in Classes V to VII. The admission process this year was advanced so as to wean away more children from private schools. Last year there was some shortfall in enrollment as children had already taken admission elsewhere. This year 118 new residential schools would be opened taking the total number of schools to 201. In Hyderabad district alone, 31 new schools are proposed to be opened. The State government has proposed to spend Rs 8,000 crore during the next five years on the residential schools which would be developed on par with corporate schools. Qualified faculty would be recruited through Telangana State Public Service Commission. The government has advanced the process of admission for Telangana Minorities Residential (TMR) Schools to February 10 from March 15 for Online Enrollment process had launched for 201 TMR schools for 2019-18 academic year. Mobile App developed for the purpose besides flagging off publicity vans. The TMR Educational Institutions Society plans to admit 56,000 students in Classes V to VII. TMREIS admission process this year was advanced so as to wean away more children from private schools. Last year there was some shortfall in enrolment as children had already taken admission elsewhere. 1. The candidates may submit application online in www.tmreis.telangana.gov.in website. 2. The selected candidates have to submit two sets of hard copies at the district head quarters with required documents as mentioned in the list of enclosures. 4. Right to admission / selection / transfer of students for admission into TMR schools is solely at the discretion of the Secretary, TMREIS. Admission Criteria: Admission will be given in the TMR Schools in the native district of the students studied during the academic year 2018-2019. VI Class – Candidate should have completed 10 years of age as on 31st August of the Academic year 2019-19 in which he/she is seeking admission. VII Class - Candidate should have completed 11 years of age as on 31st August of the Academic year 2019-19 in which he/she is seeking admission. VIII Class - Candidate should have completed 12 years of age as on 31st August of the Academic year 2019-19 in which he/she is seeking admission. IX Class - Candidate should have completed 13 years of age as on 31st August of the Academic year 2019-19 in which he/she is seeking admission. Note : 3% Reservation to PHC in all category.